Back in July, everybody chuckled a little over Deer Trail, Colorado's half-baked plan to issue drone hunting licenses and pay a bounty to any sharp shooter who bagged a flying robot. Some took the opportunity pretty seriously, though, leading to over a thousand applications and a big headache for city hall. What a successful new program! Well, not so fast. 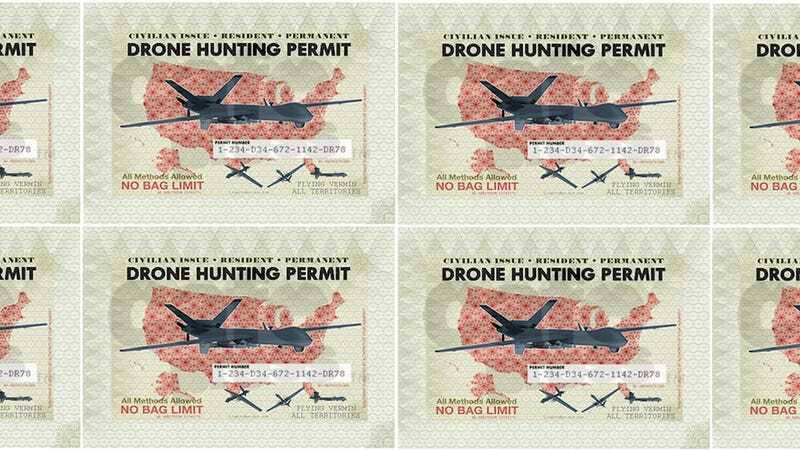 Deer Trail hasn't even passed the ordinance for the drone hunting licenses proposed earlier in the summer, so they don't actually have anything to give the hunter hopefuls who sent checks for the $25 license fee. Deer Trail's town clerk Kim Oldfield told The Denver Post this week that she stopped counting the incoming applications for the non-existent license two weeks ago, after she'd received 983 checks worth some $19,000. Now, she's just throwing the letters into a pile. It's unclear what happens from here. The last vote on the ordinance was a 3-to-3 tie, and the measure will now go to voters. Even if the voters do give it the greenlight, the drone license is potentially illegal, since it's against the law to destroy federal property. This is all assuming that Phil Steel, the town resident who proposed the ordinance, was actually serious about this from the beginning. In interviews with the local news, Steel admitted that he'd never seen a drone flying over the town and called the measure "a very symbolic ordinance."